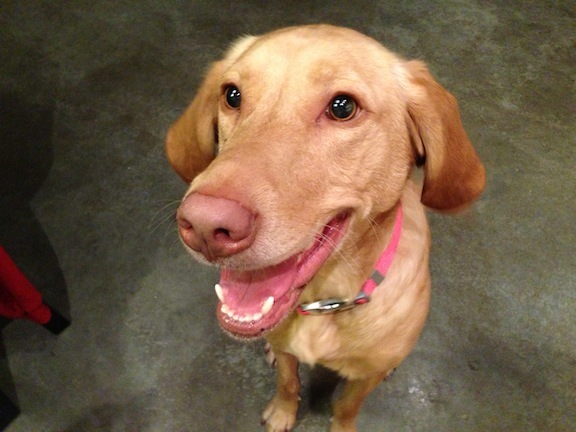 Dragon is a 2 year old female chesapeake bay retriever/ lab mix. Her owner contacted me to help stop her excessive barking, door dashing, jumping on guests and aggression to other dogs. When I arrived for the session, Dragon met me at the door barking and with her hackles up. She was clearly communicating some territorial warnings but wasnt showing any real aggression. When I sat down to discuss the situation with her owners, Dragon repeatedly showed no regard for my personal space, sticking her nose wherever she felt like it. To communicate that I wanted her to give me more personal space, I started to stand up anytime she got within 2 feet of me. As many dogs do, she probed a few times to see how determined I was. But after the fifth correction she sat down a respectful 4 feet away from me. I explained to her her owners how standing up is seen as a authoritative or powerful position or movement by dogs. Whenever a dog invades our personal space, simply standing up abruptly can communicate to the dog that you require more distance. It took 4 – 5 repetitions, but as soon as Dragon understood what I asked for, she sat down and respected my personal space. I showed her owners an exercised to help reinforce their position as leaders in the household. After repeating the exercise a few times, I coached Dragon’s owners through it as well. By repeating this leadership exercise daily for the next few weeks, Dragon will learn to look to her humans for guidance as well as respect their authority. Because Dragon had a tendency to dash out the door anytime she could, I showed her owners how to claim the doorway. Dragon’s home has a long hallway that leads from the front door into the loft apartment. I had a member of the household leave and return a few minutes later to test Dragon’s response. As soon as the knocking started, Dragon immediately started barking and charged the door. Her tail was stiff and up, her hackles overall pushed out, there was a harshness to her bark and her body was very tense. I moved between Dragon and the hallway that led to the front door and move towards her claiming the space as my own. Initially, Dragon protested and attempted to get around me. But after a few blocked attempts, she moved further and further away from the door. Once she sat down and stopped barking, I turned and started to walk towards the door. As soon as I was 10 feet away from her she started to move towards the door again. I immediately turned around and marched back towards her in a very deliberate fashion to communicate that she was not allowed in the hallway. Dragon responded by immediately moved back to the former position then sitting down quietly. I only had a to correct her one more time before I was able to open the door and let the person inside. It will take some practice, but Dragon understood what we were asking pretty quickly so I imagine that the door dashing will soon be a thing of the past. Next we went outside for a short walk so that I could see her Dragon’s reaction to other people and dogs. Because of her intense reaction to other dogs, I had fitted her up with a Martingale collar and added my special twist of the leash. We didn’t have to go far to see her reaction as someone was getting out of the elevator as soon as we got out of the front door. Dragon started barking and showed her hackles to the person. She wasn’t being dominant-aggressive, it was more of a territorial behavior. I showed her owners how to disagree with the behavior and a few corrections to help snap her out of it. As soon as we walked out the lobby door we ran into one of the buildings other dog owners. The Beegle barked once or twice from a distance which got Dragon’s attention and her intensity. She started barking very aggressively and excitedly while pulling on the leash with quite a bit of strength. I was able to settle Dragon down from a distance and attempted to move her closer to the other dog to gauge her intensity. The Beagle avoided eye contact and looked away which communicates that it wasnt a threat or challenger, but Dragon continued barking and lunging. While I was able to control her, Dragon became more agitated the closer we got to the other dog. After the Beagle went inside, Dragon calmed down as we walked away, but was still in an agitated state. Her owner mentioned that this is the same reaction that they get from her anytime she’s around a dogs that she doesn’t know as well as some people. This became clear a moment later as one of the buildings tenants came outside to smoke a cigarette. Dragon immediately perked up and started barking even though she was 25 feet away. After correcting her, Dragon was able to settle down and stop barking. I had her owner walk her towards the woman that she was barking at, two steps at a time. Each time the Dragon started to bark at the woman, her owner corrected her and then praised her when she calmed down and stopped barking. It took about 10 minutes walking forward only 2 steps at a time, but we were able to get within 8 feet of the woman before she finished her cigarette and went back inside. Because this happens both inside and outside of their home, Dragon’s behavior is indicative of a dog that considers her humans as her property and doesn’t have a lot of confidence in meeting unknown dogs. I always say this is similar to a you boy who first realizes he likes girls. Not knowing how to communicate that he likes her, the boy pulls her pigtail or slugs her in the arm. Dragon doesn’t know how to approach other dogs and thinks she is a leader over her humans which is a bad combination. The step-by-step approach-exercise that I demonstrated will help Dragon learn to stop reacting to other people when her owner correct her with good timing. It will take some practice and quite a few repetitions but Dragon’s progress with the woman indicates that she can clearly be rehabilitated. The leadership exercises that I showed her owner earlier will help accelerate the rehabilitation process if her owners practice that exercise a few times a day for the next few weeks. Aside from Dragon’s hostility towards other dogs, she’s very well behaved. Her energy level is medium low and she does not lack confidence. By adding rules and structure to her daily life, repeating the leadership exercises and desensitizing her slowly every time that she reacts to a person or dog, Dragon will learn to remain calm and balanced state of mind when she encounters strange people and dogs in the future. Once that happens, introducing her to balanced well mannered dogs in a controlled setting (after a structured walk) will be the final step to overcoming her dog aggression.